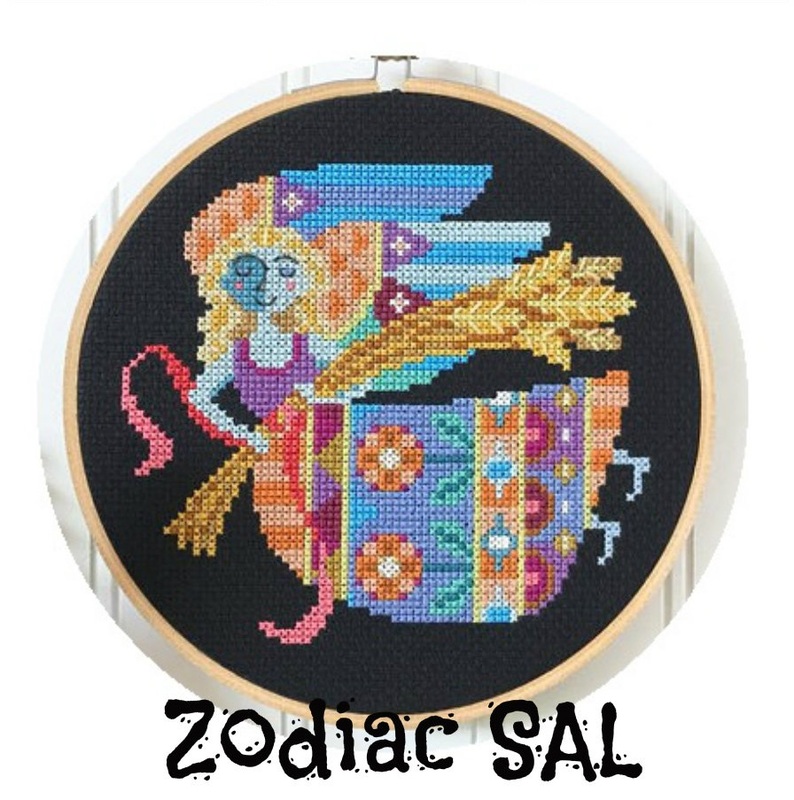 Welcome to the Zodiac SAL. I will be posting on the first Saturday of each month with information about that month's sign and a linky for anyone who wants to join in. The linky will stay open until the end of the month. Aries is the Latin name for the ram and the symbol for the sign shows the ram's curly horns. 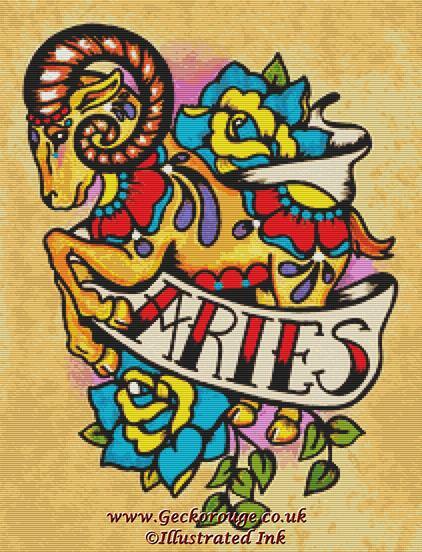 Aries is a Fire sign and covers those born between 21st March and 19th April. It is the first sign of the Zodiac. 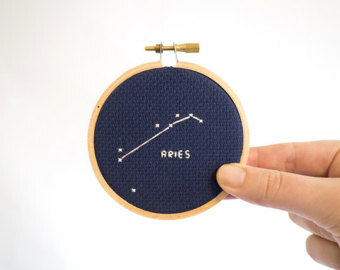 In ancient Egyptian astronomy, Aries was associated with the god Amon-Ra, who was depicted as a man with a ram's head and represented fertility and creativity. By Babylonian times it came to represent the Ram and then specifically the ram whose fleece became the Golden Fleece of Ancient Greek mythology. I had to stitch some guide lines in to make sure Aries was stitched in exactly the right place! This is the place for you to link up if you want to join in, please link to the actual blog post, not your blog homepage and include your name so we can see who has joined in. Finally, the Easter Treasure Hunt Blog Hop is still ongoing. You have until the end of Friday 13th to leave a comment with the solution to the Mystery Phrase to enter the draw to try win a Mystery prize! 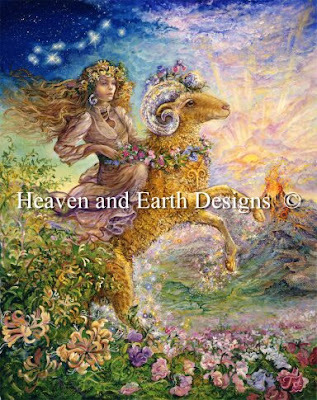 My DH is an Aries! He has been looking for projects all day and I just wanted a lazy Saturday!! Your stitching is just lovely! Wonderful stitching Jo , always so bright and so beautiful. This SAL looks prettier each time you share it. Beautiful progress on your zodiac piece. Goose in a bonnet is growing beautifully too. Love Aries and your goose is growing really quickly! Your goose is stitching up really cute! I'm an Aries, definitely stubborn like the Ram. Love the J Wall chart! 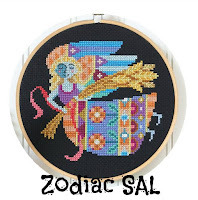 And another sign of the Zodiac is up. Interesting again to read more details about it. And to see a new stitched sign on your wonderful blue fabric. I don't know anyone who is an Aries. Well, at least not knowingly. The goose is looking good. 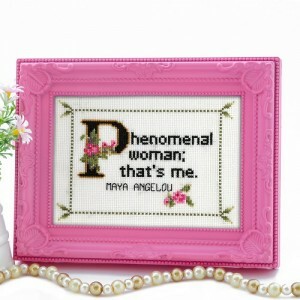 I can think of several people who are that Maya Angelou design!